Cons: Not all WRT units have serial ports. Tools/parts Required: Soldering iron. Max232 kit and/or CA-42 or DKU-5 USB cable. If you just want a console cable the easiest and cheapeast way to go is to purchase a Nokia USB phone cable. There are two models that work, a DKU-5 or CA-42. I have read that there are different chipsets in these cables but I believe you should be fairly safe with the CA-42. I have one of each that I purchased from Amazon for less than $2 each. When I plug them in to my Linux machine they both are detected as "pl2303" in the dmesg output and show up as /dev/ttyUSB0. 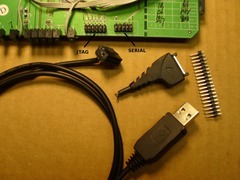 In the picture below you can see the DKU-5 cable that I have already modified. I soldered header pins onto the WRT54G (this one is a WRT54G v2.2), cut the end off the DKU-5 and connected a 10 pin header. Now all you have to do is plug one end of the cable onto the board and plug the other end into your PC and load up a communications program (I use minicom in Linux). Set the speed to 115,200,8,N,1 using /dev/ttyUSB0. Now boot your router and you should see console messages. When the router is booted just press ENTER to go to the console shell. Only 3 wires are needed for the console cable. My CA-42 only had 3 wires in it and the DKU-5 had 4 wires. The 3 needed wires will connect to pins 4 (Tx), 6 (Rx), and 10 (GND) on the board. 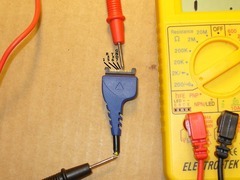 Cut the end off of the CA-42/DKU-5 cable and use a multimeter to find what color wire is associated with pins 5 (Rx), 6 (Tx), and 7 (GND) in the picture below. Connect whatever color wire associated with pin 5 on the cable to pin 6 on a 10 pin header plug. Connect whatever color wire associated with pin 6 on the cable to pin 4 on the 10 pin header plug. Connect whatever color wire is associated with pin 7 on the cable to pin 10 on the 10 pin header plug. That's it. In the above picture I didn't have an extra 10 pin header plug lying around but I did have a bunch of old IDE cables so I just took a pair of side cutters and cut off the last 10 pins to make a 10 pin header. I removed the IDE cable and connected the 3 wires from the Nokia cable to the appropriate pins and then put a little hot glue on it for support. Now, if you want to be able to plug it into a regular serial port you'll have to go through a little more work. It might be easier to just point you to Jim Buzbee's excellent instructions. I created a Frankenstein version out of an AD233DK dual port serial kit that will allow me to connect any type of connector. I can connect to the console port (ttyS0) via 9 pin serial, RJ45, or USB. 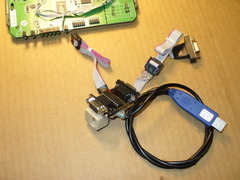 The second serial port (ttyS1) has both a male and female 9 pin. Don't ask me why, I just got carried away. Just ran across this site which looks to have a lot of good info and he also used a Micro SD card.